Will SONGS go dark before the 2022 license expires? At a meeting in Maryland on Tuesday night, Southern California Edison officials continued in their attempts to convince federal regulators it was safe to partially restart one of the shut down reactors at the San Onofre Nuclear Generating Station. The meeting was billed as an opportunity for regulating officials to ask the operators if they had the technical capability to operate the troubled plant safely, and serious questions were raised about the on-going technical evaluation to determine if in fact Edison has demonstrated that they can do that. It is not surprising that the utility is fighting the potential shut down of the nuclear reactors, they of course desire no alteration, and when it is attempted – have vehemently opposed it. They have found the existing system and process profitable in the past, and only desire such changes as will ensure it is equally profitable in the future. The present restart plans put forward by the utility are abortive, because as the reader will find, they work to combine incompatibles, and while they disturb everything, settle nothing. When an interest is not governed by recognition that it is responsible for its actions to some higher duty, it may be amusing, or even exhilarating for those involved, but it possesses no more social significance than the affairs of ants and bees or the strutting of peacocks. In transcripts of meetings between regulators, the utility, and organizations opposing the restart, the utility has been arguing for the use of non-disclosure agreements to privatize information and reports, despite the contention of the public. It appears that once again, competition, or the fear of competition, has been promoted as an effective substitute for honesty. The California Public Utilities Commission has also opened an independent investigation to evaluate whether utility customers should get a rate reduction on a plant that has not produced power since Jan. 31. Edison, San Diego Gas & Electric, submitted their first formal arguments against a rate suspension or rebate this week. Edison has already billed the manufacturer Mitsubishi Heavy Industries for $45 million, while the bill for repairs, inspections and replacement power has already easily exceeded $350 million. It is a condition of economic freedom that no one should be ruled by an authority which they cannot control. No one can argue that industrial interests should be subordinated to the public interest and to the local community in such a way as to render the best services technically possible, and further that those who render no service should not be paid at all. At the very moment when everyone is pushing the importance of increased production, capacity, and resiliency, the last question which apparently occurs to anyone is why resources and energy should be squandered and wasted on futile activities, or in expenditure which is either disproportionate to service or made for no service at all. 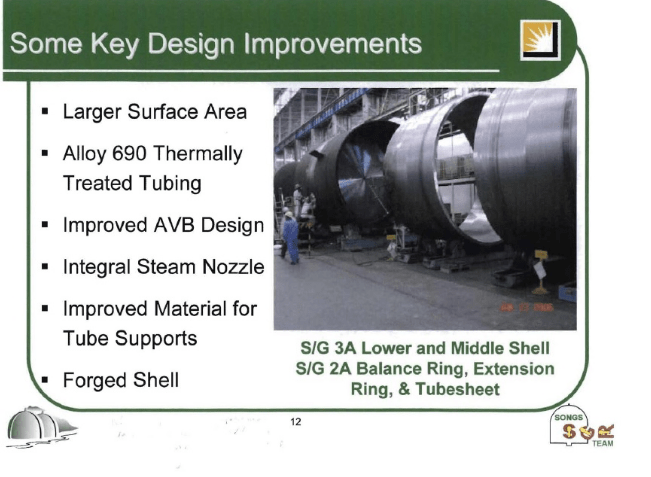 Leading up to the meeting, Southern California Edison had promised to address how it plans to keep steam tubes from vibrating during use, causing the sort of excessive wear that prompted the shutdown in the first place. At the meeting however, regulators demanded a more detailed analysis and formal requests for additional information. Inspectors asked for in-depth explanations of particular nuances and functions of equations that predicted the thermodynamic environment inside of the steam generators, and requested equations that calculated how long it took for a steam tube inside a generator to start to wear out and how long from the start of wear until complete failure. “The questions concern the adequacy of the steps that Edison is taking to ensure that the plant can be operated safely,” said NRC spokesman Victor Dricks. In October, Southern California Edison submitted a plan to NRC proposing that the federal regulators allow the utility to restart the Unit 2 reactor at 70% power. The utility effectively wanted allowance to continue operation for a five-month test run at reduced power, and then shut down the reactor to check on potential tube wear. This approach drew harsh criticism from critics. SCE officials argued that running Unit 2 at only 70% power significantly reduces fluid velocities and results in less energy causing tubes to vibrate. When Southern California Edison released its proposal to restart the Unit 2 reactor at the San Onofre Nuclear Generating Station, they also claimed that the newly redesigned ‘more sensitive’ system incorporated sensitive monitors to detect unusual vibrations, and further stated that this upgrade would allow the operators to monitor the potential damage in the steam generators. The original monitoring system was a pivotal issue in the federal investigation after the plant was shut down in January. In the Unit 3 reactor, which has shown more extensive damage from tubes rubbing against supports and each other, thirty alarms sounded over 11 months after monitors positioned in the reactor’s two steam generators were triggered after sensing unusual movements, according to documents and Nuclear Regulatory Commission officials involved in the probe. The accelerometers are designed to detect loose or broken parts, are positioned near the bottom of the 65-foot high generators. NRC officials say, from their location in the generators, it would be difficult or even unlikely to pick up vibration and friction among tubes at the other end, where damage was concentrated. One NRC official argued that the equipment could not do the job described by the company or provide additional safety if the plant is restarted. “The instrumentation that you’re proposing … does not appear to be capable of detecting the conditions that would lead to actual tube wear,” said Richard Stattel of the NRC’s instrumentation branch. The NRC staff “doesn’t understand where that adds an additional safety margin” as proposed by the company, he added. Mike Short, an Edison consultant, told regulators that the company “had not intended” to characterize the system as a “defense-in-depth” safeguard. Short said the data collected by the system could be used in future research examining vibrations picked up by the monitors. “It’s our plan … to make sure that’s clear” he said. After analysis by an outside contractor that reviewed some of the data, found that the signals picked up by the Unit 3 monitors were similar in nature to what would occur with steep temperature changes when a reactor is starting up or shutting down, but were detected in the Unit 3 reactor while in normal operation. The utility had not reported this anomaly in their reports, and the failure to identify such excessive changes inside of the generators does not leave much hope that the monitors in Unit 2 would provide much meaningful data in the event of a restart.